Hello Stampers! The last few days Whimsy Stamps has released a bunch of beautiful products. 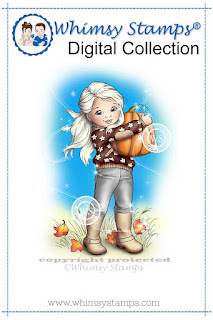 This A Girl and Her Pumpkin is a part of their digital release package. I colored her in using Copic markers. The Hello was die-cut multiple times to add dimension. You can see more new release products over at the Whimsy Stamps blog here. Hi, Kim! I love this image and your card. You may remember me from the Tuesday Throwdown DT. I had to quit when my Dad passed away. Life was very difficult at that time. I love your projects and follow you often.